Three and a half years after the first Nissan Leaf went on sale, Nissan USA has announced the cost of a replacement lithium-ion battery pack for its electric car. It’s a surprisingly low $5,499 (after a $1,000 credit for turning in the old pack, which is required), plus installation fees and tax. The installation is estimated at roughly 3 hours of labor. Fitting the replacement pack to 2011 and 2012 Nissan Leaf models requires a special $225 installation kit, which makes the new battery “backward compatible” with even the earliest Leaf models. The replacement 24-kilowatt-hour packs will use a new and more heat-tolerant battery chemistry that reduces capacity loss under very high temperatures. Nissan declined, however, to discuss any potential plans for offering higher-capacity replacement batteries in the future. While Nissan may be losing money initially on the $5,500 price, it is likely counting on low initial demand for replacement packs and future economies of scale in battery making as sales of its battery-electric vehicles continue to rise. As of the end of this month, about 125,000 Nissan Leafs will have been sold globally–roughly 56,000 of them in the U.S. The news on the pack-replacement cost appeared recently in a post on the MyNissanLeaf forum by Brian Brockman, a senior manager of corporate communications at Nissan. 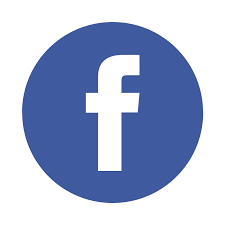 In 24 hours, the post generated more than 125 comments–largely approving, though far from unanimously so. The retail price replaces an earlier lease plan for replacement batteries announced by Nissan in June 2013. As Brockman said, “We went back to the drawing board” after “spirited discussion (and very vocal criticism)” of that plan. The new heat-tolerant battery chemistry will also be fitted to all future Nissan Leaf vehicles, starting with the 2015 models now on sale. While the performance and range of the Leaf doesn’t change with the updated battery, Nissan says the new formulation–called by some Leaf advocates the “lizard battery”–is more capable of resisting very high temperatures. Unlike many other battery-electric cars, the Nissan Leaf uses only passive cooling for its battery–meaning the pack simply sheds heat to the air rather than shedding heat to either cooled air or liquid coolant circulating through the pack itself. This had led to capacity loss in a few Leafs operated in extremely hot cities like Phoenix, Arizona. Less of a problem of course in the colder UK. While Nissan maintained that those losses were due to high mileage and within expected parameters, the pressure exerted by a small number of vocal and extremely unhappy owners raised concerns over capacity loss among Leaf owners at large. Nissan also said that its finalizing details of a financing plan for the replacement battery, estimated at roughly $100 a month over five years. 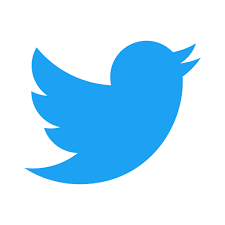 It expects to release full details of the new-battery financing program by the end of the year. After the five years of payments have been made, the buyer would own the new pack outright under that program. The replacement Leaf battery packs will be warranted for 8 years/100,000 miles against defects in manufacturing, and 5 years/60,000 against loss of capacity beyond nine out of 12 bars of capacity, or roughly 70 percent of the original energy content. Old batteries turned in during the replacement process will be recycled, Nissan said, or possibly retained for secondary usage–perhaps for building energy storage–by the company’s separate 4R Energy business unit. We have known the US specifications and pricing for some time and now we have ours. 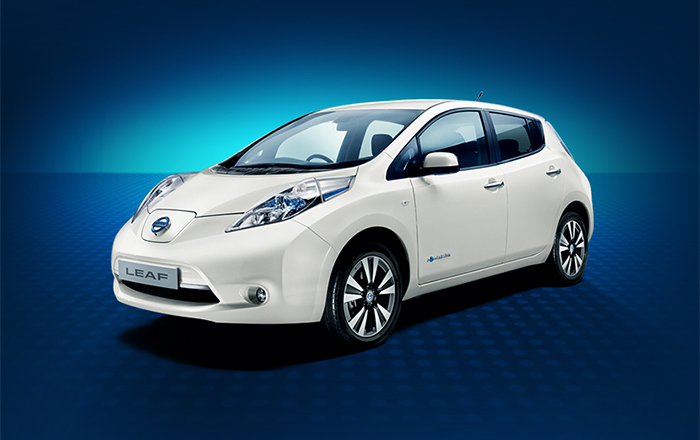 As well as updating the Leaf is terms of looks and specifications Nissan have also updated the way you can purchase a Leaf. There are now three models: Leaf Visia, Acenta and Tekna with an outright ownership or purchase prices of £21K, £23,500 and £25,500 or you can now select Leaf Flex where you own the car and lease the battery pack: These prices in turn are £16K, £18,500 and £20,500 with a £70 per month leaf battery lease cost. We welcome the increase in options that Nissan have dreamt up as this will allow more customers to take advantage of the all-electric Leaf. If you regard the monthly battery fee of £70 as a fuel cost which is about the same as filling the tank on any car in the UK then you can regard this as a running cost rather than a capital charge. This is reasonably smart thinking. Nissan’s innovative customer focused approach has resulted in over 100 fascinating new features for the Nissan LEAF, including an updated Carwings system, and even a warranty plan for lithium-ion batteries. Other enhancements include an increased boot capacity, an improved front charging port area, better i-Key features and an improved overall comfort level. Remote access to the front charging port, introduction of an LED light within the charging port area, increased boot space, much improved comfort and the availability of the New Nissan LEAF in not one, but 3 versions – all as a result of customer feedback. The New Nissan LEAF’s improved chassis, adapted by Research and Development for the European market, makes for better handling resulting in more fun and excitement at the wheel. Improvements in performance and power have meant greater choice in terms of the size of vehicle, whereas previously electric cars were tiny, funny looking cars, now they come in all shapes and sizes up to attractive family sized cars. 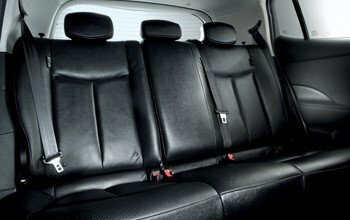 Power steering, air conditioning and all the comforting luxuries you’re used to are all included, plus a few new ones. Your smart phone and laptop can communicate with your LEAF so you can check out charging points on your route, start the cabin heating or cooling so it’s comfortable as soon as you get in. There’s no exhaust pipe and nasty fumes to inhale when you walk into the garage either, that is something to make a noise about. Since the first generation of electric vehicles many years ago, technology, design and efficiency have improved beyond recognition. No longer a slow, unresponsive drive – electric cars like the Nissan LEAF are now a viable, attractive option for all kinds of driver. More and more of the world’s major car manufacturers now have, or are planning to introduce an electric vehicle to their range, maximising Government incentives to make them an affordable choice. Electric vehicles now offer dynamic acceleration, improved torque and motorway speeds that deliver comparable driving experience and comfort to petrol and diesel vehicles, only quieter, cheaper and with significantly less impact on the environment. All the fun – none of the fumes. Hidden within the three available models are surprising technological innovations waiting to be discovered. The new Nissan Carwings system enables you to control the heating and charging of your Nissan LEAF remotely and also logs information on charging, usage patterns and distance driven. WHAT WOULD YOU LIKE TO LISTEN TO? 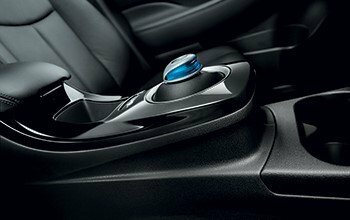 With BOSE Energy Efficient Series sound system installed within its plush exteriors the new LEAF is equipped to please. Want subwoofer bottom end? You can have it. 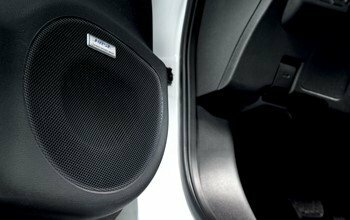 So no matter what’s playing, the New Nissan LEAF will ensure you enjoy the music to the full. B-mode is a new additional drive mode that complements Normal and Eco drive modes. It allows you to engage in regenerative braking while decelerating and maximise energy recovery. It’s particularly effective whilst going downhill. 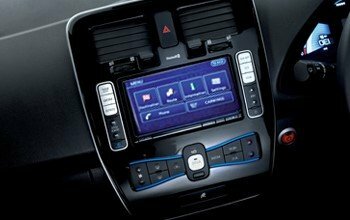 The New Nissan LEAF comes with an Around View Monitor (AVM) that helps you to park precisely. A network of cameras helps that you see the vehicle’s 360° surroundings as from above. The result: perfect parking every time. Most Nissan LEAF owners recharge their cars at home. 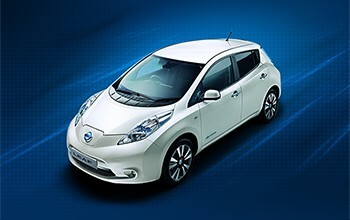 The 6.6kW charger option lets you charge your Nissan LEAF at home in just 4 hours using a 32A Home Charging Unit. The dashboard LEDs indicate the status of charging. Charging port illumination is standard on all grades, the Nissan LEAF Visia, Acenta and Tekna. To stop charging the lithium-ion battery your Nissan LEAF, simply unplug the cable. 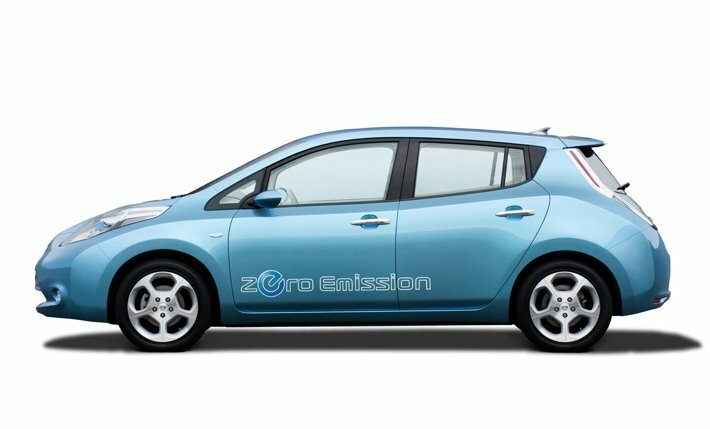 You can find below detailed information on the various ways to recharge the lithium-ion battery of your Nissan LEAF. Nissan LEAF’s battery has the ability to retain the maximum possible charge capacity even after multiple charges. Resulting from 20 years of experience and investment, Nissan LEAF’s lithium ion battery is compact, powerful, safe and durable.They are located under the car; in other words, that means you have more room in the boot and the cabin while still enjoying a long-range (up to 124 miles on a single charge) and speeds up to 90mph. And true to Nissan LEAF’s minimal environmental impact, the lithium-ion battery is also more than 95% recyclable. Nissan is so confident in their revolutionary lithium–ion battery that we are expanding your warranty for all European owners retrospectively. 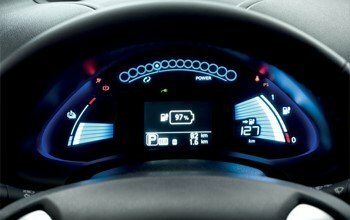 Now, all Nissan LEAF drivers will be covered if the battery range goes below 9 out of the 12 bars displayed on your dashboard, over a period of 5 years or 60,000 miles. That means a guaranteed high performance! Your Nissan LEAF comes with a 6 metre long cable* allowing you to recharge your battery using a standard household outlet** in about 10 hours. The cable can also be used on some public charging stations throughout the UK. The recommended method of home charging is via a Home Charging Unit installed by Nissan’s Electro-mobility partner, British Gas. The unit will be installed on a dedicated 16A or 32A circuit ensuring total safety and peace of mind. In its third year on the United States market, the updated 2013 Nissan Leaf will have a slightly longer range, a new and lower-priced base model, faster charging, and a more efficient cabin heater. 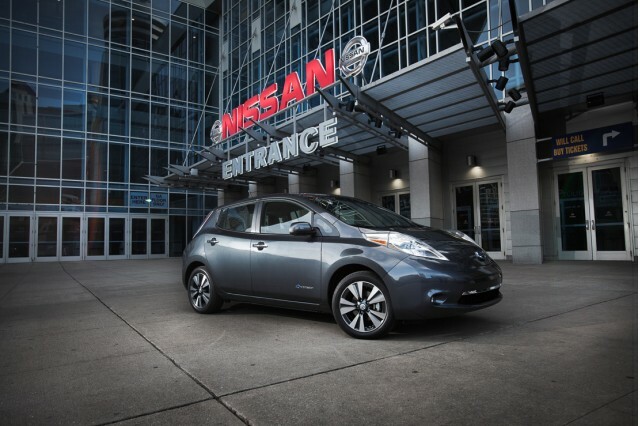 The 2013 Leaf is scheduled to enter production at Nissan’s assembly plant in Smyrna, Tennessee, this week. The higher range comes not from a larger battery –the lithium-ion pack remains at 24 kilowatt-hours–but from improvements to aerodynamics, regenerative braking, and energy management. Nissan says the drag coefficient has been cut from 0.29 to 0.28. The much-rumored 6.6-kilowatt onboard charger will be an extra-cost option on the base model, but standard equipment on the two upper trim levels–as it is on the 2013 Ford Focus Electric. It reduces the charging time for a fully depleted battery from seven hours to about four, using a Level 2 charging station. The onboard charger in all 2013 Leafs has also been reduced in size and relocated to a new position under the hood, which increases cargo volume by removing the “charger hump” found on the load-bay floor on earlier cars. Nissan is offering a new and optional hybrid heater that cuts energy consumption compared to the electric resistance heater used on 2011 and 2012 Leaf models. The new base trim level is called the Leaf S model. It replaces the LED headlights with less expensive projector beams, and uses 16-inch steel wheels with plastic covers rather than alloy wheels. It also loses both the navigation system and the remote connectivity that allows drivers to turn on the climate control and monitor battery charging remotely using a smart phone. 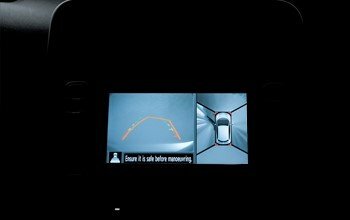 The Leaf S offers an optional rear-view camera that displays on the smaller display screen in the center stack. The 6.6-kW charger is optional as well. 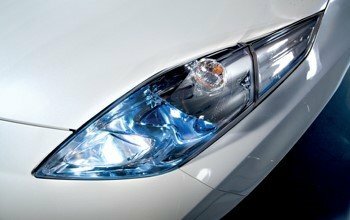 The middle trim level, the 2013 Leaf SV, rides on 16-inch alloy wheels and offers the LED headlamps and running lamps as an option. The top-range trim level, the Leaf SL, adds a number of new standard features, including leather seats and a new design for its 17-inch alloy wheels. It features the LED headlamps as standard equipment. 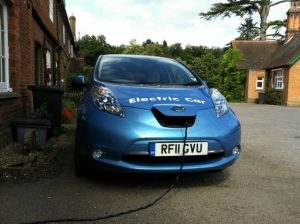 AS of Jan 2013 the UK Nissan Leaf cost £25,990 on the road. This includes the £5,000 government grant. There is talk of Leaf production moving to the Nissan plant at Sunderland. Nissan has yet to confirm this and has to announce a price for the expected lower cost 2013 UK model. Some are expecting a price of around £22 thousand. If you want a Nissan Leaf then getting one before the start of January could net you a hefty cash-back offer right now. Some Nissan dealers are advertising a $9,775 cash-back offer direct from Nissan Motor Acceptance Corp (NMAC), Nissan’s car finance arm. The offer has been running since the start of December, and ends on January 2, 2013. Details on the offer through the dealer websites are limited, but the offer appears to apply solely to lease customers. The cash-back deal should clear Nissan’s current stock of Leaf models, before the updated 2013 car is revealed at January’s Detroit Auto Show. Full details for the 2013 Leaf haven’t yet been revealed, though the new model is set to include a cheaper model with lower equipment levels than the current Leaf SV. 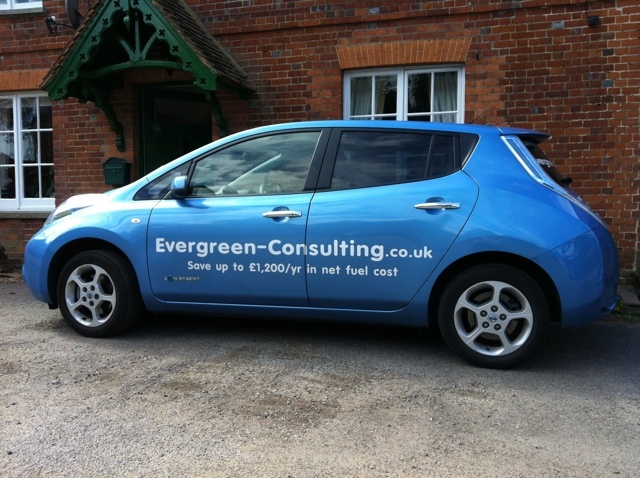 Today a Nissan leaf owned by our friend Robert Sharpe of EV Consultancy, EverGreen Consulting, came by for a visit, test drive and a quick charge. We do like the Leaf – it offers superb engineering with solid build quality and reliability. Robert is driving close to 20,000 miles per year on electricity in the Leaf and loving it. 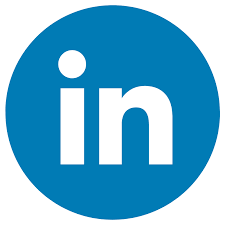 For more details on EverGreen EV Consulting see their website.